The reaction of cyanoacetylhydrazine 1 with furan-2-aldehyde 2 gives the hydrazide-hydrazone derivative 3. The latter compound undergoes a series of heterocyclization reactions to give new heterocyclic compounds. The antitumor evaluation of the newly synthesized products against three cancer cell lines, namely breast adenocarcinoma (MCF-7), nonsmall cell lung cancer (NCI-H460) and CNS cancer (SF-268) were recorded. Some of the synthesized compounds show high inhibitory effects. Substituted aminothioxomethyl hydrazides are important building blocks in synthetic heterocyclic chemistry. The S/N regioselective nucleophilic competition in the synthesis of heterocyclic systems by intermolecular and intramolecular cyclization, as well as the change in reaction conditions which might favor N-attack or S-attack or even attack on the substituted terminals are important factors for the diversity of the produced heterocyclic systems from the title reaction precursor. On the other hand, the synthetic potential and biological activity of several heterocyclic related to the named hydrazides have been explored to the maximum extent. Among the pharmacological profiles are their antimicrobial [1,2], antitubercular [3,4], anticonvulsant [5,6] anti-inflammatory [7,8], antidepressant , antitumor , and analgesic activities . Continuing our interest in developing new heterocyclic systems based on hydrazide-hydrazones [12,13] as well as design and synthesis of heterocyclic with promising biological activities [14-17], we focused our work on developing novel polyfunctionalized heterocyclic compounds with potential bioactivity. 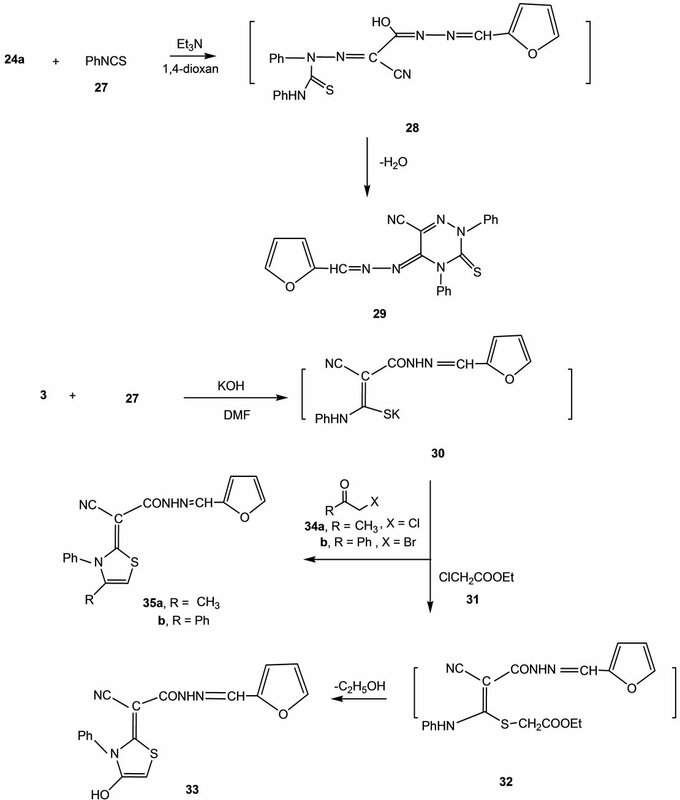 In this work we report the reaction of cyanoacetylhydrazine (1) with furan-2-aldehyde (2) to give the hydrazidehydrazone derivative 3, the structure of which was confirmed on the basis of analytical and spectral data. Thus, the 1H NMR spectrum showed a singlet at δ 6.60 (2H) ppm corresponding to CH2 group, a multiplet at δ 6.52 - 7.88 (3H) ppm corresponding to furan protons, a singlet at δ 7.54 (1H) ppm corresponding to CH group, and a singlet (D2O-exchangeable) at δ 11.62 (1H) ppm corresponding to NH group. The formed hydrazide-hydrazone derivative 3 was subjected through a series of heterocyclization reactions to form products with expected pharmaceutical applications. Thus, condensation of 3 with benzaldehyde (4) in ethanolic/piperidene solution gave the benzylidene derivative 5. The reaction of compound 5 with either hydrazine hydrate (6a) or phenylhydrazine (6b) gave the pyrazole derivatives 7a and 7b, respectively. Scheme 1. 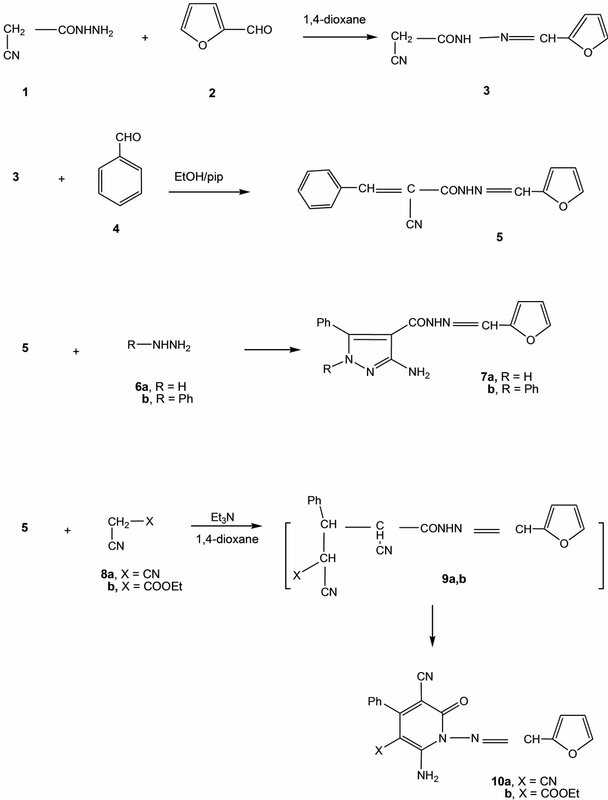 Synthesis of compounds 3, 5, 7a,b and 10a,b. (D2O-exchangeable) at δ 7.05 (2H) ppm equivalent to the NH2 group, a multiplet at δ 7.17 - 7.40 (5H) ppm indicating the phenyl protons and a singlet at δ 7.56 (1H) ppm corresponding to the CH group. Scheme 2. Synthesis of compounds 10a,b, 14 and 16a,b. other hand, compound 3 condensed with salicylaldehyde (13) to give the coumarin derivative 14. The analytical and spectral data of compound 14 are in agreement with the proposed structure. Thus, the 1H NMR spectrum showed, a singlet at δ 6.95 (1H) ppm corresponding to coumarin H-4, a singlet at δ 7.52 (1H) ppm corresponding to CH group, a multiplet at δ 6.52 - 7.88 (3H) ppm corresponding to furan protons, a multiplet at δ 7.33 - 7.55 (4H) ppm corresponding to aromatic protons and a singlet (D2O-exchangeable) at δ 11.61 (1H) ppm corresponding to NH group. The reactivity of compound 3 towards 1,3-dicarbonyl compounds was studied to afford pyridine derivatives with wide range of biological activities thus, the reaction of 3 with either acetylacetone (15a) or ethyl acetoacetate (15b) gave the pyridine derivatives 16a and 16b, respectively (cf. Scheme 2). The structures of the latter products were established on the basis of analytical and spectral data. Thus, 1H NMR spectrum of 16b showed a triplet at δ 1.35 (3H) ppm corresponding to CH3 group, a singlet at δ 2.34 (3H) ppm corresponding to CH3 group, a quartet at δ 4.22 (2H) ppm corresponding to CH2 group, a singlet at δ 5.79 (1H) ppm corresponding to pyridine proton, a singlet at δ 7.51 (1H) ppm corresponding to CH group and a multiplet at δ 6.52 - 7.88 (3H) ppm corresponding to furan protons. On the other hand, we studied the reactivity of compound 3 with cyanomethylene reagents thus, the reaction of 3 with either malononitrile (8a) or ethyl cyanoacetate (8b) gave the 2-pyridone derivatives 19a,b. The formation of the latter products took place via the intermediate formation of 17a,b (cf. Scheme 3). The 1H NMR spectrum of 18b as an example showed a singlet at δ 5.80 (1H) ppm corresponding to the pyridine proton, a multiplet at δ 6.52 - 7.88 (3H) ppm corresponding to furan protons, a singlet (D2O-exchangeable) at δ 7.00 (2H) ppm corresponding to NH2 group, a singlet at δ 7.52 (1H) ppm corresponding to CH group, and a singlet (D2O-exchangeable) at δ 12.56 (1H) ppm corresponding to OH group. The reaction of 3 with either acetophenone (19) or 4- methoxy acetophenone (20) in ammonium acetate gave the Knoevenagel condensated products 21 and 22 respectively. Next, we studied the reactivity of the active methylene group present in compound 3 towards diazonium salts. Thus, the reaction of compound 3 with aryldiazonium chlorides 23a-23d gave the phenylhydrazone derivatives 24a-24d. Analytical and spectral data of the latter products are all consistent with the proposed structures (see experimental section). Compound 24a reacted with ethyl cyanoacetate (8b) to give the pyridazine derivative 26. The reaction took place via the intermediate formation of 25 (cf. Scheme 3) On the other hand, the reaction of 24a with phenyl isothiocynate (27) gave the triazine derivative 29 via the intermediate formation of 28 (cf. Scheme 3). Analytical and spectral data of the latter product are in agreement with the proposed structure. Recently our research group was involved through a comprehensive program dealing with studying the reaction of phenylisothiocyanate with active methylene reagents followed by heterocylization with α-haloketones. The reactions lead to the formation of either thiazole or thiophene derivatives depending on the reaction conditions and the nature of the α-halocarbonyl compounds. In continuation of this program we report here the reaction of compound 3 with phenylisothiocyanate (27) in DMF solution containing KOH to form the intermediate potassium sulphide salt 30. The latter intermediate under went heterocyclization upon reaction with ethyl chloroacetate (31) to give the thiazole derivative 33. Formation of the latter product took place via the intermediate formation of 32. Similarly the reaction of 30 with α- chloroacetone (34a) or phenacyl bromide (34b) gave the thiazole derivatives 35a and 35b, respectively (Scheme 4). Analytical and spectral data are consistent with the proposed structures. Thus, 1H NMR spectrum of 35a showed a singlet at δ 2.35 (3H) ppm corresponding to CH3 group, a singlet at δ 5.81 (1H) ppm corresponding to thiazole proton, a multiplet at δ 6.25 - 7.20 (5H) ppm corresponding to aromatic protons, a multiplet at δ 6.52 - 7.88 (3H) ppm corresponding to furan protons, a singlet at δ 7.52 (1H) ppm corresponding to CH group and a singlet (D2O-exchangeable) at δ 11.62 (1H) ppm corresponding to NH group. Fetal bovine serum (FBS) and L-glutamine, were from Gibco Invitrogen Co. (Scotland, UK). RPMI-1640 medium was from Cambrex (New Jersey, USA). Dimethyl sulfoxide (DMSO), doxorubicin, penicillin, streptomycin and sulforhodamine B (SRB) were from Sigma Chemical Co. (Saint Louis, USA). Samples Stock solutions of selected compounds from 3-34a,b were prepared in DMSO and kept at −20˚C. Appropriate dilutions of the compounds were freshly prepared just prior the assays. Final concentrations of DMSO did not interfere with the cell growth. Three human tumor cell lines, MCF-7 (breast adenocarcinoma), NCI-H460 (non-small cell lung cancer), and SF-268 (CNS cancer) were used. MCF-7 was obtained from the European Collection of Cell Cultures (ECACC, Salisbury, UK) and NCI-H460 and SF-268 were kindly provided by the National Cancer Institute (NCI, Cairo, Egypt). They grow as monolayer and routinely maintained in RPMI-1640 medium supplemented with 5% heat inactivated FBS, 2 mM glutamine and antibiotics (penicillin 100 m/mL, streptomycin 100 mg/mL), at 37˚C in a humidified atmosphere containing 5% CO2. Exponentially growing cells were obtained by plating 1.5 × 105 cells/mL for MCF-7 and SF-268 and 0.75 × 104 cells/ mL for NCI-H460, followed by 24 h of incubation. The effect of the vehicle solvent (DMSO) on the growth of these cell lines was evaluated in all the experiments by exposing untreated control cells to the maximum concentration (0.5%) of DMSO used in each assay. The effect of selected compounds from the newly synthesized products 3-35a,b was evaluated on the in vitro growth of three human tumor cell lines representing different tumor types, namely, breast adenocarcinoma (MCF- 7), non-small cell lung cancer (NCI-H460) and CNS cancer (SF-268), after a continuous exposure of 48 h. the evaluations of the newly synthesized products were measured using doxorubicin as the positive control and the results are summarized in Table 1. Scheme 3. Synthesis of compounds 18a, 18b, 21, 22, 24a-24d and 26. Scheme 4. Synthesis of compounds 29, 30, 33 and 35a,b. 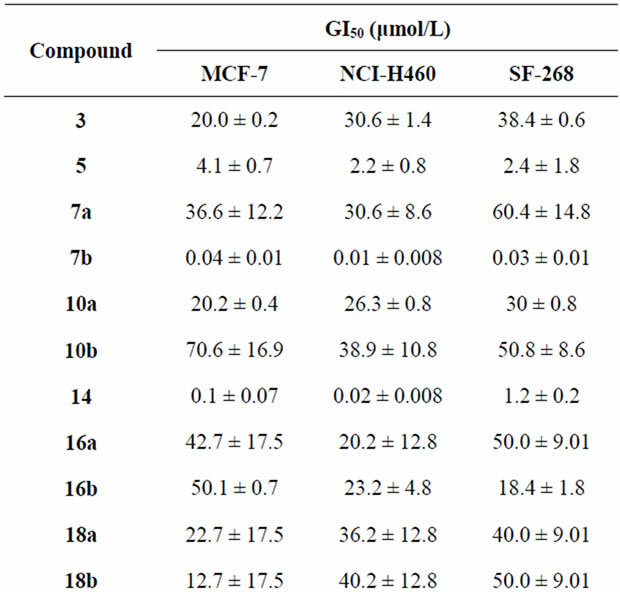 that some compounds like 10b, 16a,b and 35b showed very low activity towards certain cell line, MCF-7, and moderate activity towards other cell lines. Results are given in concentrations that were able to cause 50% of cell growth inhibition (GI50) after a continuous exposure of 48 h and show means ± SEM of three-independent experiments performed in duplicate. Table 1. Effect of the newly synthesized products on the growth of three human tumor cell lines. the reaction of cyanoacetylhydrazine with furan-2-aldehyde. The produced product underwent a series of heterocyclizations. 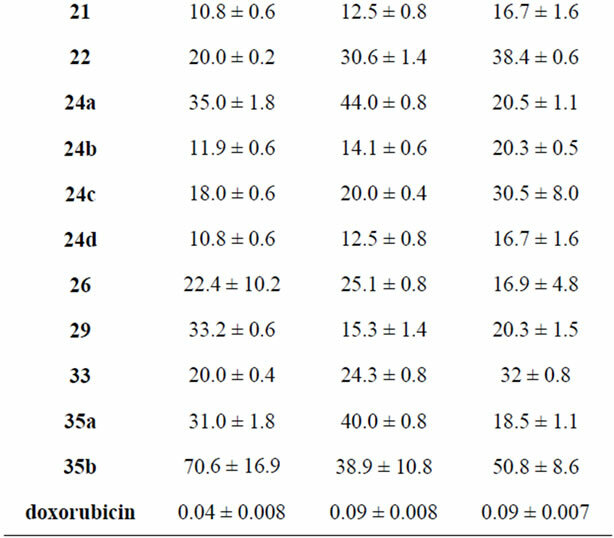 Their antitumor evaluations through the three cancer cell lines showed that compounds 7b and 14 showed the maximum inhibitory effect among the tested compounds. All melting points were determined in open capillaries and are uncorrected. Elemental analyses were performed on a Yanaco CHNS Corder elemental analyzer (Japan). IR spectra were measured using KBr discs on a Pye Unicam SP-1000 spectrophotometer. 1H NMR spectra were measured on a Varian EM 390 - 200 MHz instrument in CD3SOCD3 as solvent using TMS as internal standard and chemical shifts are expressed as δ ppm. Mass spectra were recorded on Kratos (75 eV) MS equipment (Germany). Elemental analyses were carried out by the Micro-analytical Data Center at Cairo University and were performed on Vario EL III Elemental CHNS analyzer. To a solution of compound 1 (0.099 g, 1.0 mmol) in 1,4- dioxane (30 mL) and furfural (2) (0.09 g, 1.0 mmol) were added. The reaction mixture was heated under reflux for 3 hr, then was left until the reaction mixture be cooled. The formed solid product was collected by filtration. Yellow crystals from 1,4-dioxane, 98% (0.097 g) yield; mp. 190˚C - 192˚C, MS: m/z = 177 (M+), IR (KBr): υ/cm−1 = 3200 (NH), 3059 (CHAr), 2198 (CN), 1690 (CO), 1550 (C=N), 750 (C-O), 1H NMR (DMSO-d6): δ = 6.60 (s, 2H, CH2), 6.52 - 7.88 (m, 3H, furan-CH), 7.54 (s, 1H, CH), 11.62 (s, 1H, NH, D2O-exchangeable). Analysis Calcd for C8H7N3O2 (177.16): C, 54.24; H, 3.98; N, 23.72%. Found: C, 54.11; H, 4.25; N, 23.59%. To a solution of compound 3 (0.177 g, 1.0 mmol) in ethanol (30 mL), piperidine (3 drops) and benzaldehyde (4) (0.10 g, 1.0 mmol) were added. The reaction mixture was heated under reflux for 3 h, and then poured on an ice/water mixture containing a few drops of hydrochloric acid. The formed solid product was collected by filtration. Yellow crystals from 1,4-dioxane, 95% (0.168 g) yield; mp. 140˚C - 142˚C, MS: m/z = 265 (M+), IR (KBr): υ/cm−1 = 3200 (NH), 3159 (CHAr), 2200, 1680 (2CN), 1580 (C = C), 1550 (C = N), 780 (C-O), 1H NMR (DMSO-d6): δ = 6.52 - 7.88 (m, 3H, furan-CH), 7.84 (s, 1H, CH), 7.33 - 7.60 (m, 5H, HAr), 8.45 (s, 1H, CH), 11.61 (s, 1H, NH, D2O-exchangeable). Analysis Calcd for C15H11N3O2 (265.27): C, 67.92; H, 4.18; N, 15.84%. Found: C, 68.26; H, 4.28; N, 15.93 %. Synthesis of pyrazole derivatives 7a,b. General procedure: To a solution of compound 5 (0.265 g, 1.0 mmol) in 1,4-dioxane (25 mL) and dimethylformamide (10 mL), either hydrazine hydrate (6a) (0.05 g, 1.0 mmol) or phenylhydrazine (6b) (0.10 g, 1.0 mmol) was added. The reaction mixture in each case was heated under reflux for 3 h, and then poured on an ice/ water mixture containing a few drops of hydrochloric acid. The formed solid product in each case was collected by filtration. Brown crystals from 1,4- dioxane/dimethylformamide mixture, 87% (0.230 g) yield, mp. 250˚C - 252˚C, IR (KBr): υ/cm−1 = 3380 (NH2), 3400, 3320 (2NH), 3200 (CHAr), 1680 (CO), 1560 (C=N), 780 (C-O), 1H NMR (DMSO-d6): δ = 6.52 - 7.88 (m, 3H, furan-CH), 7.00, 7.20 (s, 2H, NH2, D2O-exchangeable), 7.41 - 7.79 (m, 5H, HAr), 7.55 (s, 1H, CH), 11.62 (s, 1H, NH, D2O-exchangeable), 13.7 (s, 1H, pyrazole-NH, D2Oexchangeable). Analysis Calcd for C15H13N5O2 (295.30): C, 61.01; H, 4.44; N, 23.72 %. Found: C, 61.34; H, 4.62; N, 23.91 %. Yellowish brown crystals from 1,4-dioxane/dimethylformamide mixture, 90% (0.238 g) yield, mp. 148˚C - 150˚C, IR (KBr): υ/cm−1 = 3370 (NH2), 3250 (NH), 2690 - 3400 (CHAr), 1665 (CO), 1600 (C=N), 775 (C-O), 1H NMR (DMSO-d6): δ = 6.52 - 7.88 (m, 3H, furan-CH), 7.41 - 7.79 (m, 10H, HAr), 7.00, 7.20 (s, 2H, NH2, D2O-exchangeable), 7.55 (s, 1H, CH), 11.62 (s, 1H, NH, D2O-exchangeable). Analysis Calcd for C21H17N5O2 (371.39): C, 67.91; H, 4.61; N, 18.86%. Found: C, 68.20; H, 4.81; N, 19.02%. Synthesis of pyridine derivatives 10a,b. Method A: To a solution of compound 5 (0.265 g, 1.0 mmol) either malononitrile (8a) (0.06 g, 1.0 mmol) or ethyl cyanoacetate (8b) (0.11 g, 1.0 mmol) was added in 1,4-dioxane (30 mL) containing triethylamine (3 drops). The reaction mixture was heated under reflux for 3 h. then poured on an ice/water mixture containing a few drops of hydrochloric acid. The solid product formed in each case was collected by filtration. Method B: To a solution of compound 3 (0.177 g, 1.0 mmol) either benzylidene malononitrile (11a) (0.154 g, 1.0 mmol) or benzylidene ethyl cyanoacetate (11b) (0.201 g, 1.0 mmol) was added in 1,4-dioxane (30 mL) containing triethylamine (3 drops). The reaction mixture was heated under reflux for 3h, and then poured on an ice/water mixture containing a few drops of hydrochloric acid. The solid product formed in each case was collected by filtration. Dark red crystals from 1,4-dioxane, yield [75% (0.198 g), method A; 95% (0.168 g), method B], mp. 190˚C - 192˚C, MS: m/z = 329 (M+), IR (KBr): υ/cm−1 = 3300 (CHAr), 3220 (NH2), 2350, 2480 (2CN), 1665 (CO), 1580 (C=N), 1H NMR (DMSO-d6): δ = 6.52 - 7.88 (m, 3H, furan-CH), 7.05 (s, 2H, NH2, D2O-exchangeable), 7.17 - 7.60 (m, 5H, HAr), 7.56 (s, 1H, CH). Analysis Calcd for C18H11N5O2 (329.31): C, 65.65; H, 3.37; N, 21.27%. Found: C, 65.73; H, 3.59; N, 21.38%. Brown crystals from 1,4-dioxane, yield 74% (0.196 g), method A; 98% (0.173 g), method B], mp. 180˚C - 182˚C, MS: m/z = 376 (M+), IR (KBr): υ/cm−1 = 3210 (NH2), 3180 - 3050 (CHAr), 2380 (CN), 1660 (CO), 1565 (C=N), 1190 (C-O), 1H NMR (DMSO-d6): δ = 1.29 (t, 3H, J = 7 Hz, CH3), 4.24 (q, 2H, J = 7 Hz, CH2), 6.52 - 7.88 (m, 3H, furan-CH), 7.05 (s, 2H, NH2, D2O-exchangeable), 7.17 - 7.40 (m, 5H, HAr), 7.56 (s, 1H, CH). Analysis Calcd for C20H16N4O4 (376.37): C, 63.82; H, 4.28; N, 14.89%. Found: C, 63.90; H, 4.41; N, 14.58%. To a solution of compound 3 (0.177 g, 1.0 mmol) in 1,4-dioxane (20 mL), piperidine (3 drops) and salicaldhyde (13) (0.12 g, 1.0 mmol) were added. The reaction mixture was heated under reflux for 2 h, and then poured on an ice/water mixture containing a few drops of hydrochloric acid. The solid product was collected by filtration. Yellow crystals from dimethylformamide, 95% (0.168 g) yield, mp. 280˚C - 282˚C, MS: m/z = 282 (M+), IR (KBr): υ/cm−1 = 3400 (CHAr), 3100 (NH), 1700, 1600 (2CO), 1550 (C=N), 1H NMR (DMSO-d6): δ = 6.95 (s, 1H, coumarin C4-H), 7.52 (s, 1H, CH), 6.52 - 7.88 (m, 3H, furan-CH), 7.33 - 7.55 (m, 4H, HAr), 11.61 (s, 1H, NH, D2O-exchangeable). Analysis Calcd for C15H10N2O4 (282.25): C, 63.83; H, 3.57; N, 9.92%. Found: C, 63.97; H, 3.73; N, 10.31%. Synthesis of pyridine derivatives 16a,b. General procedure: To a solution of compound 3 (0.177 g, 1.0 mmol) either acetylacetone (15a) (0.1 g, 1.0 mmol) or ethyl acetoacetate (15b) (0.13 g, 1.0 mmol) was added in 1,4-dioxane (25 mL) containing piperidine (3 drops). The reaction mixture was heated under reflux for 5 h, and then poured on an ice/water mixture containing a few drops of hydrochloric acid. The solid product formed in each case was collected by filtration. Brown crystals from 1,4-dioxane, 85% (0.150 g) yield, mp. 80˚C - 82˚C, MS: m/z = 241 (M+), IR (KBr): υ/cm−1 = 2942, 2932 (2 CH3), 2900 (CHAr), 2300 (CN) 1620 (CO), 1565 (C=N), 1H NMR (DMSO-d6): δ = 2.22, 2.34 (2s, 6H, 2CH3), 5.78 (s, 1H, pyridine H-3), 7.52 (s, 1H, CH=N), 6.52 - 7.88 (m, 3H, furan-CH). Analysis Calcd for C13H11N3O2 (241.25): C, 64.72; H, 4.60; N, 17.42%. Found: C, 64.82; H, 4.44; N, 17.72%. Reddish brown crystals from dimethylformamide, 82% (0.145 g) yield, mp. 240˚C - 242˚C, MS: m/z = 271 (M+), IR (KBr): υ/cm−1 = 2940 (CH3), 2910 (CHAl), 2900 (CHAr), 2280 (CN), 1630 (CO), 1560 (C=N), 1070 (C-O), 1H NMR (DMSO-d6): δ = 1.35 (t, 3H, CH3), 2.34 (s, 3H, CH3), 4.22 (q, 2H, CH2), 5.79 (s, 1H, pyridine H), 7.51 (s, 1H, CH=N), 6.52 - 7.88 (m, 3H furan-CH). Analysis Calcd for C14H13N3O3 (271.27): C, 61.99; H, 4.83; N, 15.49%. Found: C, 62.28; H, 4.93; N, 15.72%. Synthesis of pyridine derivatives 18a,b. General procedure: To a solution of compound 3 (0.177 g, 1.0 mmol) either malononitrile (8a) (0.06 g, 1.0 mmol) or ethyl cyanoacetate (8b) (0.11 g, 1.0 mmol) was added in 1,4-dioxane (25 mL) containing triethylamine (4 drops). The reaction mixture was heated under reflux for 3h, and then poured on an ice/water mixture containing a few drops of hydrochloric acid. The solid product formed in each case was collected by filtration. Red crystals from dimethylformamide, 95% (0.168 g) yield, mp. 250˚C - 252˚C, MS: m/z = 243 (M+), IR (KBr): υ/cm−1 = 3150, 3200 (2NH2), 2150 (CN), 1650 (CO), 1550 (C=N), 1H NMR (DMSO-d6): δ = 5.80 (s, 1H, pyridine CH), 6.53 - 7.88 (m, 3H, furan-CH), 7.00, 7.19 (2s, 4H, 2NH2, D2O-exchangeable), 7.51 (s, 1H, CH). Analysis Calcd for C11H9N5O2 (243.22): C, 54.32; H, 3.73; N, 28.79%. Found: C, 54.52; H, 3.93; N, 28.83%. Yellow crystals from 1,4-dioxane, 98% (0.173 g) yield, mp. 80˚C - 83˚C, MS: m/z = 244 (M+), IR (KBr): υ/cm−1 = 3450 (OH), 3150 (NH2), 3050 (CHAl), 2130 (CN), 1650 (CO), 1550 (C=N), 1H NMR (DMSO-d6): δ = 5.80 (s, 1H, pyridine-CH), 6.52 - 7.88 (m, 3H, furan-CH), 7.00 (s, 2H, NH2, D2O-exchangeable), 7.52 (s, 1H, CH), 12.56 (s, 1H, OH, D2O-exchangeable). Analysis Calcd for C11H8N4O3 (244.21): C, 54.10; H, 3.30; N, 22.94%. Found: C, 54.37; H, 3.42; N, 23.18%. Synthesis of hydrazide derivatives 21 and 22. General procedure: To a mixture of compound 3 (0.177 g, 1.0 mmol) either acetophenone (19) (0.12 g, 1.0 mmol) or p-methoxyacetophenone (20) (0.15 g, 1.0 mmol) a catalytic amount of ammonium acetate (0.05 g) was added. The reaction mixture was fused at 140˚C for 15 min, then left to cool. The solid product formed after boiling in dimethylformamide was collected by filtration. Dark brown crystals from dimethylformamide, 77% (0.136 g) yield, mp. 230˚C - 232˚C, MS: m/z = 279 (M+), IR (KBr): υ/cm−1 = 3250 (CHAr), 3190 (NH), 3050 (CH3), 2180 (CN), 1660 (CO), 1560 (C=C), 1H NMR (DMSO-d6): δ = 2.42 (s, 3H, CH3), 6.52 - 7.88 (m, 3H, furan-CH), 7.33 - 7.77 (m, 5H, HAr), 7.00 (s, 1H, NH, D2O-exchangeable), 7.53 (s, 1H, CH). Analysis Calcd for C16H13N3O2 (279.29): C, 68.81; H, 4.69; N, 15.05%. Found: C, 69.73; H, 4.72; N, 14.88%. Dark orange crystals from 1,4-dioxane, 75% (0.132 g) yield, mp. 178˚C - 180˚C, MS: m/z = 309 (M+), IR (KBr): υ/cm−1 = 3280 (NH), 3200 (CHAr), 3050, 3080 (2 CH3), 2180 (CN), 1650 (CO), 1580 (C=C), 1300, 1000 (2 C–O), 1H NMR (DMSO-d6): δ = 2.42 (s, 3H, CH3), 3.83 (s, 3H, CH3), 6.52 - 7.88 (m, 3H, furan-CH), 7.33 - 7.87 (m, 4H, HAr), 7.00 (s, 1H, NH, D2O-exchangeable), 7.52 (s, 1H, CH). Analysis Calcd for C17H15N3O3 (309.32): C, 66.01; H, 4.89; N, 15.52%. Found: C, 65.83; H, 4.63; N, 15.72%. 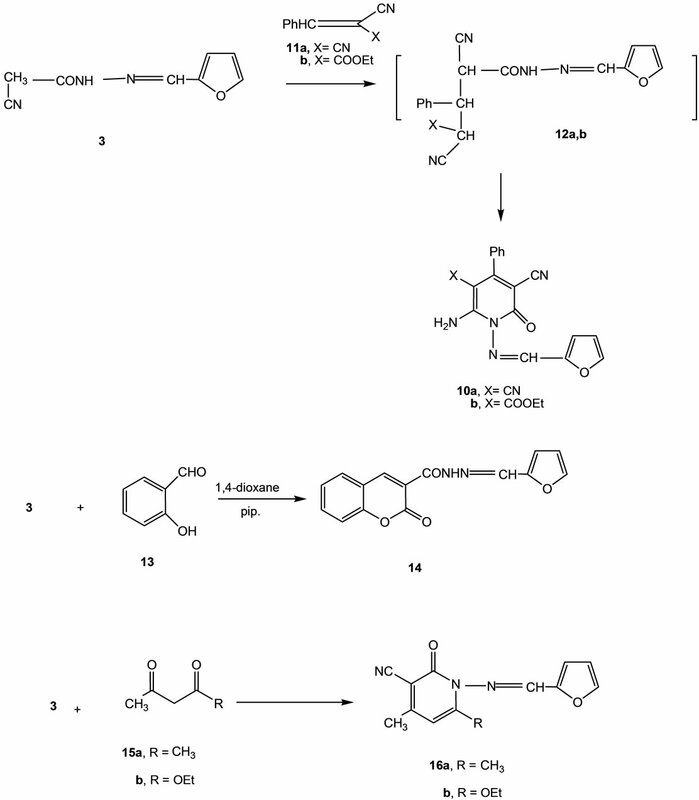 Synthesis of phenylhydrazone derivatives 24a-24d. General procedure: To a cold solution (0˚C - 5˚C) of compound 3 (0.177 g, 1.0 mmol) in ethanol (15 mL) an equimolar amount of diazotized benzenediazonium chloride (23a), 4-methylbenzenediazonium chloride (23b), 4- chlorobenzenedizonium chloride (23c) and 4-methoxybenzenedizonium chloride (23d) were gradually added under stirring. The solid product separated during stirring in an ice bath was collected by filtration and washed thoroughly with water. Yellow crystals from 1,4-dioxane, 92% (0.162 g) yield, mp. 130˚C - 132˚C, MS: m/z = 281 (M+), IR (KBr): υ/cm−1 = 3280 (NH), 3100 (CHAr), 2160 (CN), 1680 (CO), 1550 (C=N), 1H NMR (DMSO-d6): δ = 6.52 - 8.44 (m, 8H, 5HAr, furan-3CH), 7.52 (s, 1H, CH), 10.55, 11.61 (2s, 2H, 2NH, D2O-exchangeable). Analysis Calcd for C14H11N5O2 (281.27): C, 59.78; H, 3.94; N, 24.90%. Found: C, 59.92; H, 4.12; N, 24.69%. Pale yellow crystals from 1,4-dioxane, 95% (0.168 g) yield, mp. 160˚C - 162˚C, MS: m/z = 295 (M+), IR (KBr): υ/cm−1 = 3250 (NH), 3100 (CHAr), 3080 (CH3), 2150 (CN), 1670 (CO), 1550 (C=N), 1H NMR (DMSO-d6): δ = 2.34 (s, 3H, CH3), 7.53 (s, 1H, CH), 6.52-8.44 (m, 7H, 4HAr, furan-3CH), 10.55, 11.61 (2s, 2H, 2NH, D2O-exchangeable). Analysis Calcd for C15H13N5O2 (295.30): C, 61.01; H, 4.44; N, 23.72%. Found: C, 60.82; H, 4.31; N, 23.99%. Orange crystals from 1,4-dioxane, 95% (0.168 g) yield, mp. 168˚C - 170˚C, MS: m/z = 317 (M+), IR (KBr): υ/cm−1 = 3200 (NH), 3090 (CHAr), 2180 (CN), 1600 (CO), 1550 (C=N), 1100 (C-Cl), 1H NMR (DMSO-d6): δ = 7.52 (s, 1H, CH=N), 6.52 - 8.44 (m, 7H, 4HAr, furan-3H), 10.54, 11.62 (2s, 2H, 2NH, D2O-exchangeable). Analysis Calcd for C14H10ClN5O2 (315.71): C, 53.26; H, 3.19; N, 22.18%. Found: C, 53.37; H, 3.28; N, 22.09%. Reddish brown crystals from 1,4-dioxane, 96% (0.169 g) yield, mp. 150˚C -152˚C, MS: m/z = 326 (M+), IR (KBr): υ/cm−1 = 3280 (NH), 3100 (CHAr), 2160 (CN), 1680 (CO), 1550 (C=N), 1530, 1350 (NO2), 1H NMR (DMSO-d6): δ = 7.52 (s, 1H, CH), 6.52 - 8.44 (m, 7H, 4HAr, furan-3CH), 10.55, 11.61 (2s, 2H, 2NH, D2O-exchangeable). Analysis Calcd for C14H10N6O4 (326.27): C, 51.54; H, 3.09; N, 25.76%. Found: C, 51.67; H, 3.38; N, 25.83%. To a solution of compound 24a (0.281 g, 1.0 mmol) ethyl cyanoacetate (8b) (0.11 g, 1.0 mmol) was added in 1,4- dioxane (25 mL) containing triethylamine (4 drops) the reaction mixture was heated under reflux for 4 h, then poured on an ice/water mixture containing a few drops of hydrochloric acid. The solid product formed was collected by filtration. Dark brown crystals from dimethylformamide, 78% (0.219 g) yield, mp. 250˚C - 252˚C, MS: m/z = 348 (M+), IR (KBr): υ/cm−1 = 3320 (NH2), 3180 (NH), 2220 (CN), 1700, 1650 (2 CO), 1550 (C=N), 1H NMR (DMSO-d6): δ = 6.52 - 8.48 (m, 8H, 5HAr, furan-3CH), 7.10 (s, 2H, NH2), 7.50 (s, 1H, CH), 11.62 (s, 1H, NH, D2O-exchangeable). Analysis Calcd for C17H12N6O3 (348.32): C, 58.62; H, 3.47; N, 24.13%. Found: C, 58.52; H, 3.62; N, 24.40%. To a solution of compound 24a (0.281 g, 1.0 mmol) in 1,4-dioxane (25 mL) containing triethylamine (4 drops) phenyl isothiocynate (27) (0.13 g, 1.0 mmol) was added. The reaction mixture was heated under reflux for 3 h, and then poured on an ice/water mixture containing a few drops of hydrochloric acid. The solid product formed was collected by filtration. Dark orange crystals from ethanol, 63% (0.177 g) yield, mp. 60˚C - 62˚C, IR (KBr): υ/cm−1 = 3050 (CHAr), 2250 (CN), 2150 (C=S), 1550 (C=N), 1H NMR (DMSO-d6): δ = 6.25 - 8.50 (m, 10H, 10HAr), 6.52 - 7.88 (m, 3H, furan-3CH), 7.51 (s, 1H, CH). Analysis Calcd for C21H14N6OS (398.44): C, 63.30; H, 3.54; N, 21.09%. Found: C, 63.51; H, 3.22; N, 21.27%. 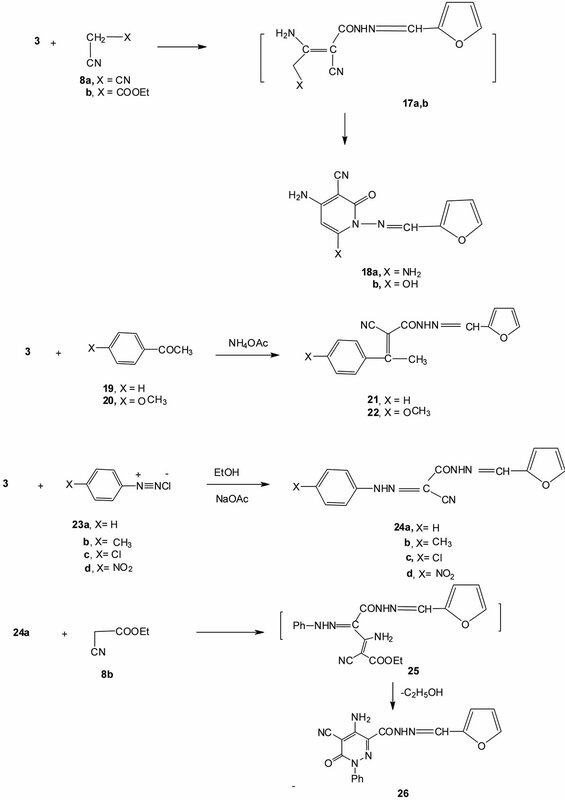 Synthesis of thiazole derivatives 33 and 35a,b. General procedure: To a solution of compound 3 (0.177 g, 1.0 mmol) in dimethylformamide (20 mL) containing potassium hydroxide (0.05 g, 1.0 mmol), phenyl isothiocynate (27) (0.13 g, 1.0 mmol) was added. The reaction mixture was stirred over night, either ethyl chloroactate (31) (0.12 g, 1.0 mmol) or chloroacetone (34a) (0.09 g, 1.0 mmol) or phenacyl bromide (34b) (0.19 g, 1.0 mmol) was added with continuation of stirring over night. Then the reaction mixture in each case was poured on an ice/water mixture containing a few drops of hydrochloric acid, and then was left over night. The solid product formed in each case was collected by filtration. Reddish brown crystals from ethanol/water, 67% (0.118 g) yield, mp. 67˚C - 69˚C, MS: m/z = 352 (M+), IR (KBr): υ/cm−1 = 3390 (OH), 3280 (NH), 3150 (CHAr), 2150 (CN), 1680 (CO), 1638 (C=C), 1580 (C=N), 1H NMR (DMSO-d6): δ = 5.79 (s, 1H, thiazole-CH), 6.25 - 7.20 (m, 5H, C6H5), 6.52 - 7.88 (m, 3H, furan-3CH), 7.51 (s, 1H, CH), 11.62 (s, 1H, NH, D2O-exchangeable), 12.55 (s, 1H, OH, D2O-exchangeable). Analysis Calcd for C17H12N4O3S (352.37): C, 57.95; H, 3.43; N, 15.90; S, 9.10%. Found: C, 58.28; H, 3.59; N, 16.04; S, 9.39%. Dark brown crystals from acetic acid, 63% (0.111 g) yield, mp. 80˚C - 82˚C, MS: m/z = 350 (M+), IR (KBr): υ/cm−1 = 3220 (NH), 2980 (CH3), 2200 (CN), 1670 (CO), 1640 (C=C), 1600 (C=N), 1H NMR (DMSO-d6): δ = 2.35 (s, 3H, CH3), 5.81 (s, 1H, thiazole-CH), 6.25 - 7.20 (m, 5H, HAr), 6.52 - 7.88 (m, 3H, furan-3CH), 7.52 (s, 1H, CH) 11.62 (s, 1H, NH, D2O-exchangeable). Analysis Calcd for C18H14N4O2S (350.39): C, 61.70; H, 4.03; N, 15.99; S, 9.15%. Found: C, 61.95; H, 3.87; N, 16.21; S, 8.88%. Dark green crystals from acetic acid, 60% (0.106 g) yield, mp. 70˚C - 72˚C, MS: m/z = 412 (M+), IR (KBr): υ/cm−1 = 3220 (NH), 3150 (CHAr), 2190 (CN), 1690 (CO), 1600 (C=C), 1620 (C=N), 1H NMR (DMSO-d6): δ = 5.81 (s, 1H, thiazole CH), 6.25 - 7.20 (m, 5H, HAr), 6.52 - 7.88 (m, 3H, furan-3CH), 7.52 (s, 1H, CH), 7.71 - 7.69 (m, 5H, HAr), 11.62 (s, 1H, NH, D2O-exchangeable). Analysis Calcd for C23H16N4O2S (412.46): C, 66.97; H, 43.91; N, 13.58; S, 7.77%. Found: C, 67.29; H, 3.66; N, 13.72; S, 8.01%. R. M. Mohareb would like to express his deepest thanks to the Alexander von HumboldtFoundation in Bonn for affording him a fellowship in Germany, LMU Munchen, during summer 2012 for doing research and completling this work.